In an earlier post I looked at the governance and management of organisations from the perspective of Systems Theory, (See the post), this post looks at the functional differences between the two roles. The purpose of any system is to deliver functionality or capability; governance and management are no different. However, for there to be a valid difference between governance and management, there has to be a different functional purpose. The purpose of this post is to define this difference! 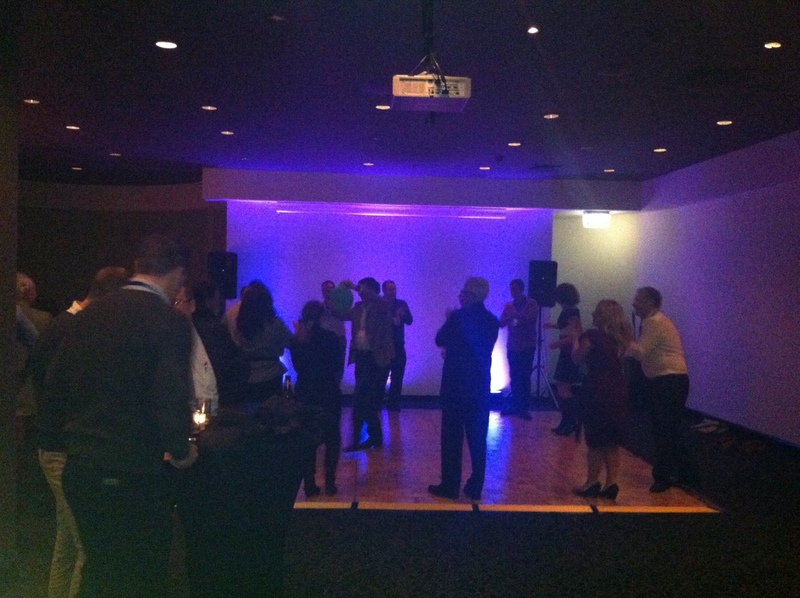 The ‘governors’ of the organisation who oversight and direct the managers. A front line supervisor or team leader may spend some of her time working as the first line of management directing the work of others, and the rest of the time as a worker producing goods or services. A newspaper editor is primarily responsible for the direction and management of sub-editors and journalist with a view to getting ‘today’s issue’ to the presses on schedule, but also functions as a knowledge worker when drafting the ‘editorial column’. In corporations, executive directors operate at the governance level when acting as Board Members, as managers when directing the operations of the organisation. The above clearly demonstrates function and position are not synonymous. But equally, it is important for a person in a position to understand the function they are currently performing. The function of any worker is to produce goods services or other outputs as efficiently as possible. In simple organisations and pre-industrialisation, workers were typically responsible for all aspects of the production process in ‘cottage industries’; exchanging their surplus production for their other needs in local markets. The advent of industrialisation and the division of work into highly specialised operations introduced the requirement for managers to organise the supply chain, the work and the workers; in order to obtain the efficiencies available from these ‘new’ production systems. The concepts of management were largely defined in the late 19th and early 20th century. There were many contributors to the development of management theory, Taylor’s Scientific Management focused on performance measurement and process optimisation. The Gilbreth’s, Henry Gantt and George Mayo added the concepts of efficiency, leadership, incentivation and motivation; and Max Weber introduced the concept of bureaucracy (standardising procedures and record keeping). Implicit in these 6 factions is the requirement for decision making! The core purpose of management is to make the optimal decisions to make the work of the organisation as efficient and sustainable as practical. The function of effective management in a well structured organisation is to create efficiencies in the accomplishment of the ‘right amount’ of the ‘right work’ at the ‘right time’ that are greater than the costs associated with managing the organisation (or at the very least, better then competing organisations). To achieve this, the functions of forecasting, planning, managing and controlling the work, and recording the outcomes; needs to be undertaken within a governance framework that informs the decision making to achieve the optimum outcomes. The damage to David Jones’ reputation and share value caused by inappropriate interactions between a senior manager and a female employee. The vast amount of damage caused to BP due to failures in safe operating procedures leading to the Deepwater Horizon disaster. An inaccurate press release leading to the conviction of several Directors of the James Hardy group (under continuous disclosure requirements of the ASX). The legal actions brought against Centro for the misallocation of debt despite receiving and applying advice from a leading international accountancy firm. The personal liability of Directors under various legislative regimes for breaches of taxation requirements, OH&S failures, insolvent trading, etc. The resources committed to implementing a future strategy cannot be used to enhance current viability or profitability causing a short term loss of value or revenue. However, if no commitment is made to develop the future of the organisation, the organisation itself will quickly become uncompetitive and irrelevant, destroying value for its owners in the longer term. Determining the right balance is a governance decision. Implementing the decision is a management function. In the area of strategic change, doing the ‘right project right’ is woefully inadequate. An effectively governed and managed organisation starts with a well defined strategy, and manages each selected project or program through the organisational changes needed to make full use of the outputs to the maximisation of the benefits realised; recognising that in a changing world, the potential benefits will be changing throughout the whole life of the initiative and adapting to optimise the overall outcomes (for more on this see: The failure of strategic planning). There are two schools of thought about governance. One body of literature sees different types of governance, primarily corporate governance, IT governance and project governance. The people developing this concept are almost exclusively project mangers, IT managers and academics focused on these disciplines. Interestingly there does not seem to be a similar body of literature focused on HR governance, financial governance or any other area of management. This school of thought sees governance being a function of almost any management position or entity responsible for overseeing the work of IT departments or projects including sponsors and project boards. The alternative school of thought developed by organisations such as the OECD, various Institutes of Directors and the agencies responsible for governing the various stock exchanges see governance as a single process with different facets. The approaches taken by various governments in legislating liability for corporate and governance failures supports this holistic view. The Directors of corporations are being increasingly made personally responsible for governance and management failures. 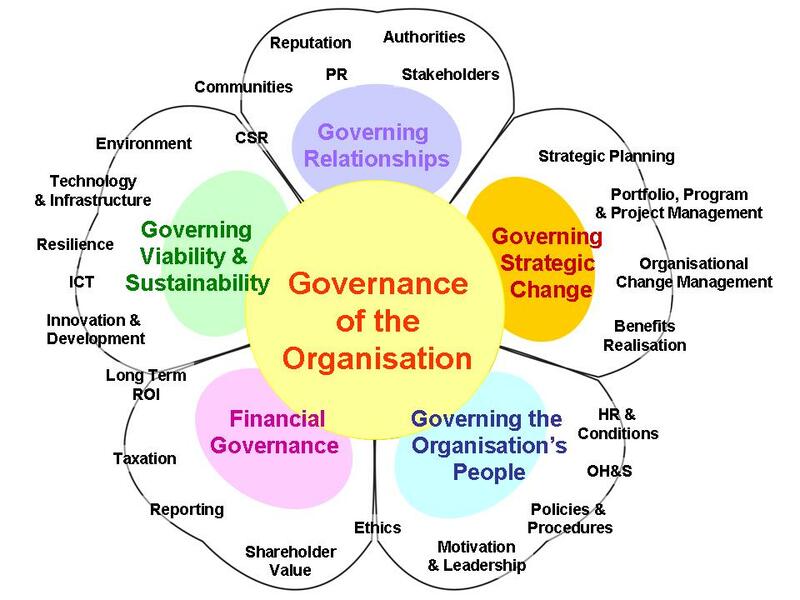 In the referenced source document: Directing Change A guide to governance of project management, the body defined as responsible for governance is the organisations ‘Board’. In this context, the term ‘board’ applies to management boards and their equivalents in the public sector and to councils in companies limited by guarantee. It does not refer to project boards. 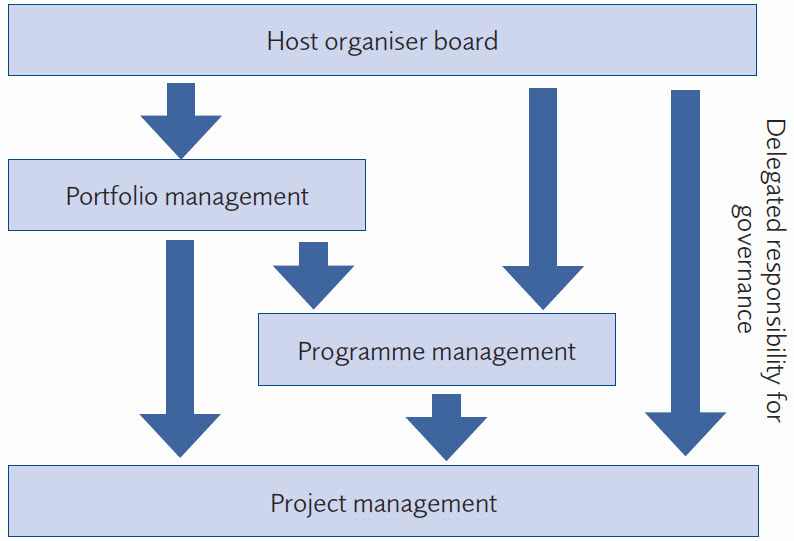 Figure 1.2 Governance Structure © 6th Edition, APM-BoK, UK. The concept of delegation outlined above is important; a key principle in managing governance is summed up in the legal doctrine ‘delegatus non potest delegare’… unless expressly authorised a delegate cannot delegate to someone else. Part of the governing board’s responsibility is to ensure appropriate delegations of authority are made to management so they can develop an effective system of management that meets the governance needs of the organisation. However, delegating authority and responsibility to management does not remove the ultimate accountability for ensuring ‘good governance’ from the Board. Interestingly, the APM-BoK acknowledges that in poorly governed organisations project teams may have to take responsibility for governing themselves. 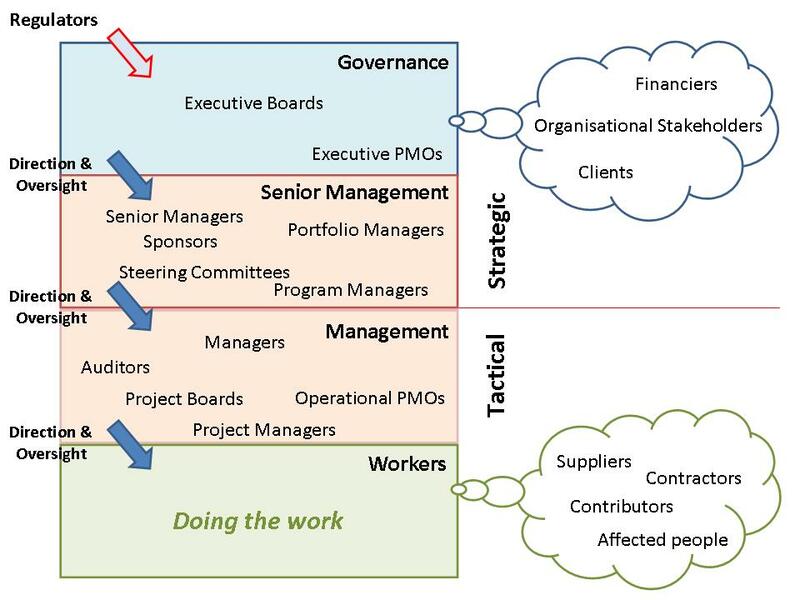 This lack of organisational maturity (and capability) is the focus of our paper ‘The Management of Project Management’ (due for publication Oct. 2012) and is the likely reason for the emergence of the separate concepts of project governance and IT governance outlined above. Unfortunately the creation of ‘special’ governance sub-sets separate from the overall governance function compounds the immature governance the special functions are supposed to resolve – when projects fail and benefits are not realised the organisation suffers as a whole. In the absence of an effective governance system these ‘project failures’ are far more likely to be caused by general management failings than by project management failings (see: Project or Management Failures?). The function of governance is and should be separate from the function of management although some managers may fulfil both governance and management functions at different times. It is a holistic process focused on the creation of sustainable value by the organisation. Authority for some aspects of governance can be delegated to management, accountability remains with the governing Board. Governance and management should be separate; importantly a manager cannot govern his/her own work. The governance structure is defined by the governing board and implemented by management (see our White Paper: Project Governance). A core aspect of good governance is making the decisions to invest in developing the appropriate capabilities to ensure organisational resources are used efficiently and effectively. The management systems and structures needed to create value from projects and programs are outlined in our White Paper: Project Delivery Capability. More immediately, whilst in South Africa, I will also be presenting an evening lecture focused on CIOB’s contribution to the effective management of time on complex projects at the University of the Witwatersrand, Johannesburg, if you can attend, download the flyer. Qantas: ‘You’re the reason we fly’??? This is a misleading advertisement; ‘You’re the reason we fly, BUT ONLY IF YOU COMPLY WITH EVERY SINGLE ONE OF OUR RULES’ would be more accurate! If you move away from Qantas’ relatively expensive full fare bookings you can expect to be treated like a number, not a valued customer. If you have not carefully read and fully understood every piece of information and complied with every restriction and limitation don’t expect any common sense of customer service from the Qantas staff. We booked a discount international business fare without looking too closely at the domestic connections. Big mistake!!! The Qantas system somehow considered it reasonable to book the Melbourne – Sydney connection with a 13 hour overnight stay in Sydney! There are 12 other flights departing after the one the system selected. Certainly if we had noticed the flight stuff up, we could have done a dozen different things to drive some common sense into the travel arrangements. The simple fact was we did not see the error, our mistake, and Qantas are refusing to provide any sensible assistance. As far as Qantas is concerned, ‘The rules are the rules and we can get stuffed’. It looks like Qantas will become yet another Australian business heading for the scrap heap driven by the accounting logic of ‘rule based cost cutting’. Despite over 20 years of flying Qantas (most as a Gold Card holder), this last episode has moved us to the point where customer loyalty will be replaced by our own cost efficiencies – there are plenty of other options out there. Net cost to Qantas from ‘applying the rules’? Probably in excess of $50,000 this financial year as we book alternative flights with other airlines – their service is likely to be bad, but Qantas is demonstrably no better so why pay more?? What ever has happened to the idea of charging a premium (already built into every Qantas fare) in return for sensible customer service and providing a great experience? If Qantas had provided a little bit of help sorting out our mistake, instead of this negative blog, Qantas would be receiving praise and on-going customer loyalty. Fixing the problem sensibly would have cost Qantas virtually nothing. As it is, Qantas ‘applied the rules’, destroyed customer loyalty, damaged its brand and has potentially lost tens of thousands of dollars in future business. A stupid outcome from a stupid system, driven by a stupid philosophy. When will bean counters learn the key to business success in the 21st century is exemplary customer service? If you don’t have loyal customers you are in a price driven commodity market and there is always someone who can undercut your price. to promote and support the use of modern P/PM for solving global problems. Focused on program and project management; the first edition of PM World Journal was published at the beginning of August 2012. This new non-refereed eJournal will be followed closely by the new PM World Library. Both the eJournal and library, will be working closely with major books publishers like Gower, Wiley, CRC, etc. The new PM World Journal is modelled after the former PM World Today in form and content (see our blog on the passing of PM World Today), but with different image, mission and web technology. We were regular contributors to the old PMWT, and expect to be supporting the new PMWJ over the coming months with a range of articles and papers. The new PM World Library will also represent a significant new development in the project management world and will provide a major new resource for professionals, practitioners, students, educators, researchers and organizations worldwide. It will become the new flagship service and will grow substantially going forward. The new library will provide the repository for articles and papers that we publish, and also provide single point access to online P/PM magazines, journals, eBooks, databases, services, news – similar to a traditional library. A major feature is an expanded Author Showcase, where each author will have a web page with profile, photo and links to all articles, papers and other works by the author in the library, a virtual archive of the author’s professional work. 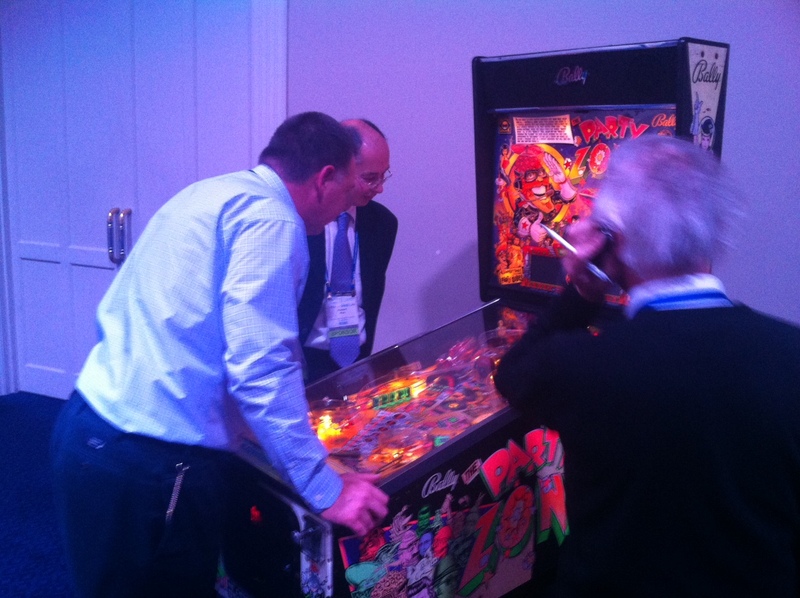 Who says project management is boring? 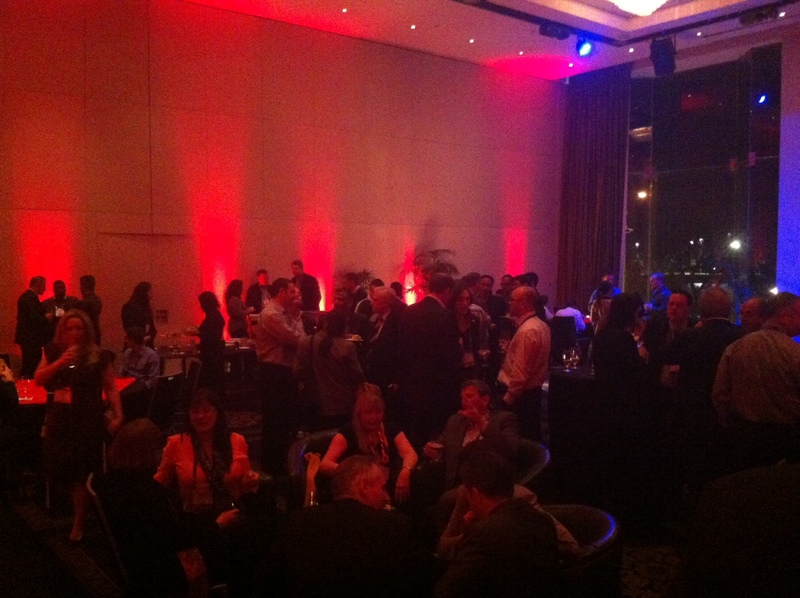 The delegates at this year’s PMOz conference have not only enjoyed a wide range of high quality papers ranging from project managing particle physics at CERN to the valuing of soft skills, but also the best project management party anywhere (officially networking…). It’s just as well today’s opening keynote is from the Lazy Project Manager (Peter Taylor) – we need some strong coffee to re-set the brain for day 2. The more serious ‘stuff’ will be on the PM Global website at www.pmgconnect.com soon. The first is by knowing who the important stakeholders are at any point in time, the expenditure on other processes such as communication can be focused where it is needed most, generating efficiencies and a ‘bigger bang for your buck’. The second is stakeholders are a major factor in the risk profile of the work, their attitudes and actions can have significant positive or negative consequences and understanding the overall community provides valuable input to a range of processes including risk identification, requirements definition and schedule management. At the most fundamental level, improving the management of stakeholders is directly linked to improving the quality of the organisation’s interaction with the stakeholders and as a consequence, the quality of the goods or services delivered to the end users or client (ie, stakeholders) as a result of being better informed whilst undertaking the work. Quality was defined by Joseph Juran as fit for purpose, this elegant definition applies equally to the quality of your management processes as it does to your production processes and to the deliverables produced. And the three elements are interlinked; you need good management systems and information to allow an effective production system to create quality outputs for delivery to the client. A failure at any point in the chain will result in a quality failure and the production on deliverables that do not meet client requirements. Placing stakeholder management within the context of quality allows access to some reasonably well researched data that can be interpolated to provide a reasonable basis for assessing the ‘return’ likely to be generated from an investment in stakeholder management. His belief was that an organization that established a quality program will see savings returns that more than pay off the cost of the quality program: “quality is free”. The challenge is knowing you fully understand who the ‘customers’ actually are, and precisely what their various requirements and expectations are, and having ways to manage mutually exclusive or conflicting expectations. Knowing ‘who’s who and who’s important’ is a critical first step. Feigenbaum’s categorization of the cost of quality has two main components; the cost of conformance (to achieve ‘good’ quality) and the cost of poor quality (or the cost of non-conformance). Derived from: Feigenbaum, Armand V. (1991), Total Quality Control (3 ed. ), New York, New York: McGraw-Hill, p. 109, ISBN 978-0-07-112612-0. The cost of achieving the required level of quality is the investment made in the prevention of non-conformance to requirements plus the cost of testing and inspections to be comfortable the required quality levels have been achieved. The cost of poor quality resulting from failing to meet requirements has both internal and external components. The internal costs are associated with defects, rework and lost opportunities caused by tying people up on rectification work. External failure costs can be much higher with major damage to an organisation’s brand and image as well as the direct costs associated with fixing the quality failure. The management challenge is balancing the investment in quality against the cost of quality failure to hit the ‘sweet spot’ where your investment is sufficient to achieve the required quality level to be fit for purpose; overkill is wasted $$$$. But first you and ‘right stakeholders’ need to agree on precisely what fit for purpose actually means. 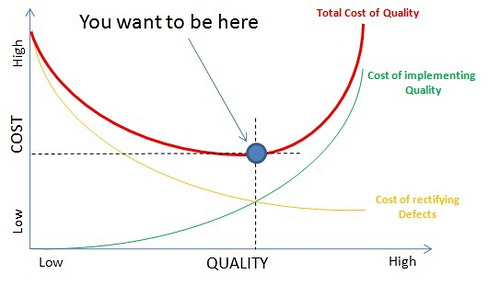 Also, the level of investment needed to achieve the optimum cost of quality is not fixed. The better the organisation’s quality systems, the lower the net cost. Six sigma proponents have assessed the total cost of quality as a percentage of sales based on the organisations sigma rating. This table demonstrates that as the quality capability of the organisation improves, the overall cost of quality reduces offering a major competitive advantage to higher rating organisations. Most organisations are rated at 3 Sigma so the opportunity for improvement is significant. Effective analysis of the stakeholder community will help you identify and understand all of the key stakeholders that need to be consulted to determine the relevant aspects of fit for purpose. Understanding the structure of your stakeholder community facilitates the implementation of an effective two-way communication strategy to fully understand and manage the expectations of key stakeholders. Effective communication builds trust and understanding within a robust relationship. o Trust reduces the cost of doing business. o Understanding the full set of requirements needed for the work to be successful reduces the risk of failure. o Robust relationships with key stakeholders also contribute to more effective problem solving and issue management. Maintaining the stakeholder engagement effort generates enhanced information that will mitigate risks and issues across all aspects of the work. Effective stakeholder management is a facilitating process that reduces the cost, and increases the efficiency of an organisations quality and risk management processes. Based on observations of similar process improvement initiatives such as CMMI, the reduction in the cost of quality facilitated by improved stakeholder engagement and management is likely to be in the order of 10% to 20%. Efficiency dividend = $250,000 x 10% = $25,000 per $1 million in sales. (or more depending on the actual costs and savings). If current expenditures on stakeholder engagement are relatively low, the additional costs of engagement will be relatively high, but the payback in reduced failures and unexpected risk events will be greater. The overall ROI is likely to be significant. If the current expenditures on stakeholder engagement are relatively high, the additional costs will be minimal (implementing a systemic approach may even save costs), however, the payback in reduced failure costs will be lower because many of the more obvious issues and opportunities are likely to have been identified under the current processes. The directly measurable ROI will be lower, offset by the other benefits of moving towards a higher ‘Sigma level’. The introduction of an effective stakeholder management system is likely to generate a significant ROI for most organisations. 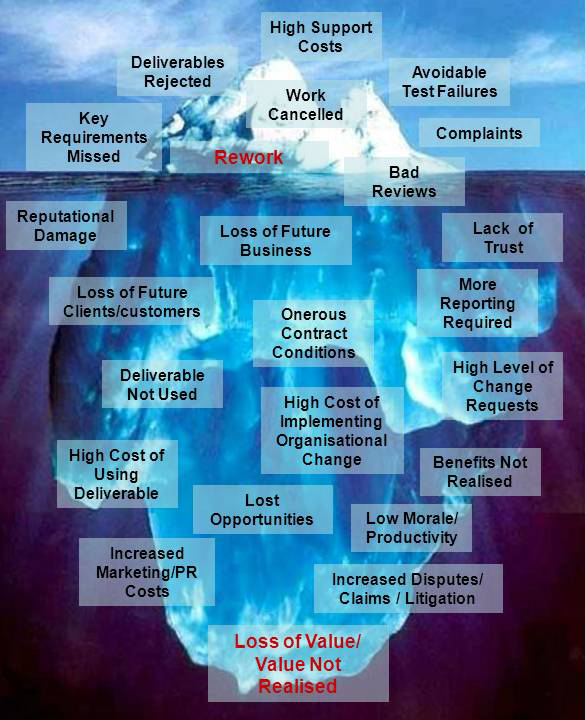 The larger part of the ‘return’ being a reduction in the hidden costs associated with poor stakeholder engagement. These costs affect reputation and future business opportunities to a far greater extent than their direct costs on current work. For this reason, we feel implementing a system such as the Stakeholder Circle is best undertaken as a strategic organisational initiative rather than on an ad hoc project or individual workplace basis. This course has been crafted to allow project managers to decide for themselves whether they want to improve the performance of their projects by apply the principles of Earned Value without the overhead associated with large, complex Department of Defence acquisition contracts. Earned schedule analysis is a breakthrough analytical technique that derives schedule performance measures in units of time, rather than cost. The same basic EVM data points are used. Indicators, similar to those for cost, are derivable from the earned schedule measure. These indicators provide a status and predictive ability for schedule, analogous to cost. 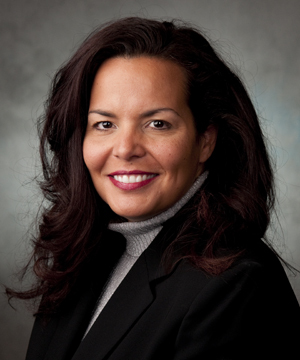 Workshop 3: Approaches to and Lessons Learned from “Internal Project Surveillance” with Lisa Wolf EVP, PMP. Lisa is the Earned Value Management (EVM) Focal Point for Booz Allen Hamilton, a leading USA global consulting firm that is committed to delivering results that endure. This workshop focuses on the approaches which can be adopted and lessons learned in setting up an internal project management surveillance function which comes from Booz Allen Hamilton’s internal experience as well as extensive experience assisting US Government agencies and other clients. Best practices which are essential for successfully establishing this function including processes, procedures, and vital internal relationship-building will be explored.